Someone who requests something in a firm manner: Mr. and Mrs. Smith were quite angry with the waiter, waiting at least 30 minutes before being served at the restaurant, so they were demanders who wanted to see the manager about such bad service. To set and to mark the limits or boundaries of something: The idea that James and Jane had of building a new house had been undetermined until they were able to demarcate some land, then their desire became a reality. © ALL rights are reserved. 1. A line on a map that marks where one area of land ends and another begins based on official decisions. 2. The division of something so its parts are separate and identifiable. 1. Someone who decides on and fixes land boundaries. 2. A person who states in a clear way where something begins and where it ends. 1. To disappear, or to cause something to disappear. 2. 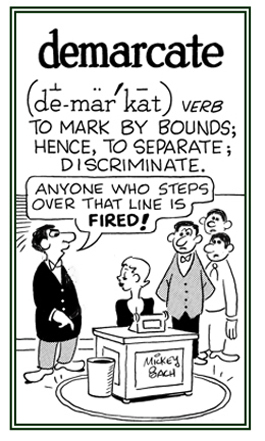 To deprive of or to lose apparent physical appearance; to make or become immaterial. 1. Significant loss of intellectual abilities; such as, memory capacity, severe enough to interfere with social or occupational functioning. 2. A rarely used term for dementia. 1. 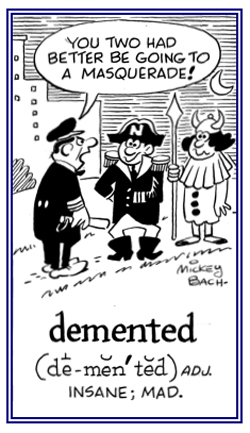 Going out of one's mind: Legally, to dement is a form of mental disorder in which cognitive and intellectual functions of the brain are being prominently affected. Impairment of memory is an early sign of dementing; total recovery is thought to be impossible since organic cerebral disease is involved. When dementing is going on, it is also existing as "adolescent insanity" or "schizophrenia". 2. 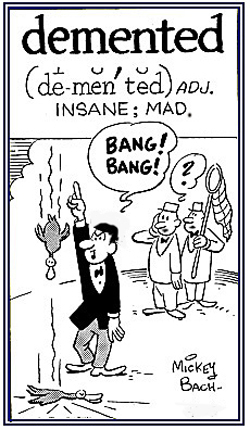 Etymology: from Latin dement, literally, "losing one's mind". 1. Characteristic of being mentally ill or insane: Trina's demented talking and ramblings were symptoms of her illness. 2. Pertaining to not being mentally well and not able to comprehend what is real or not able to think clearly: There were several of the elderly demented people in the nursing home who could not even recognize members of their own families when they came to visit. © ALL rights are reserved. 1. In an insane manner: Henry's mother could be heard screaming dementedly. 2. Relating to being unable to think or act clearly when someone is extremely worried, angry, or excited by something. 1. The loss, usually progressive, of cognitive and intellectual functions, without impairment of perception or consciousness; caused by a variety of disorders, (structural or degenerative) but most commonly associated with structural brain disease. 2. An acquired organic mental disorder with loss of intellectual abilities of sufficient severity to interfere with social or occupational functioning: Dementia is a dysfunction which is multifaceted and involves memory, behavior, personality, judgment, attention, spatial relations, language, abstract thoughts, and other functions. The intellectual decline of dementia is usually progressive and it initially does not interfere with the level of consciousness. 1. Chronic traumatic encephalopathy (any degenerative disease of the brain): A dementia pugilistica is a syndrome resulting from cumulative head blows absorbed in the boxing ring, which is characterized by general slowing of mental function, occasional bouts of confusion, and scattered memory loss. It may progress to the more serious boxer's dementia. 2. Dementia resulting from cumulative damage sustained over some years in boxing, resulting in slowed thinking, memory loss, dysarthria (speech that is characteristically slurred, slow, and difficult to produce; and therefore, difficult to understand), and other movement disorders: Dementia pugilistica, also called chronic traumatic encephalopathy, pugilistic Parkinson's syndrome, boxer's dementia, and punch-drunk syndrome, is a neurological disorder which affects some career boxers and others who receive multiple blows to the head. 3. A condition seen in boxers (and alcoholics), caused by repeated cerebral concussions and characterized by weakness in the lower limbs, unsteadiness of gait, slowness of muscular movements, hand tremors, hesitancy of speech, and mental dullness: The condition of dementia pugilistica develops over a period of years, with the average time of onset being about sixteen years after the start of a career in boxing. Showing page 25 out of 44 pages of 646 main-word entries or main-word-entry groups.